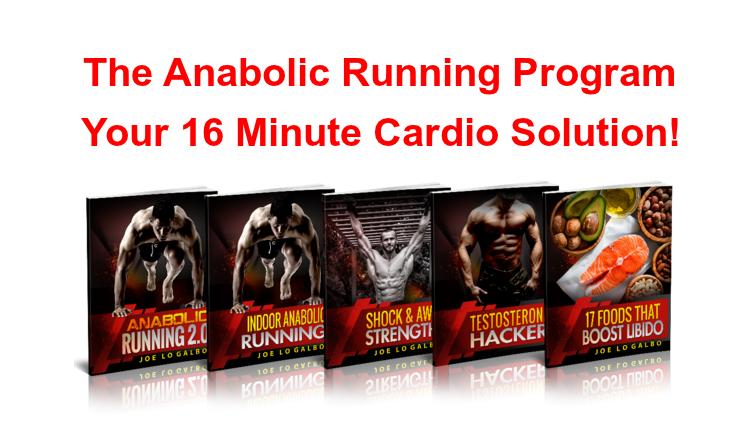 The Anabolic Running Program is a supercharged 16 minute solution to your cardio needs. Using the principals of High Intensity Interval Exercising (HIIE). You will discover how to get better results in less time! In addition to saving yourself some time and wasted effort. This program will train you on how you can protect and increase your natural testosterone levels. Yes, I said protect your testosterone levels. Traditionally, studies have only focused on the effects long endurance training sessions had on women. However, in recent times those study have changed. More and more studies have been conducted to study the effects of endurance training on men. To be more specific, the focus has been on the effects of the hormone that separates the two sexes, Testosterone. One such study published in the US National Library of Medicine. Even suggest that testosterone levels are found to be higher in untrained men over those that train for long periods. It is bad enough that our natural testosterone levels begin to decline at the young age of 30. But now we are learning that long bouts of endurance training further worsen the problem. So what can we do? The answer is found hidden in the principals of HIIE training. Other studies have shown that short, high intensity blasts of exercise have positive effects on testosterone levels. More testosterone means more muscle and less body fat. Both things are great news for us guys. And just so we don’t kill anyone’s “Runner High”, there is a solution available to us. You can have your cake and eat it too! 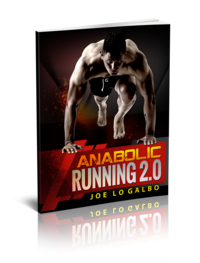 The Anabolic Running Program delivers the best of both worlds. It allows you to get the cardio benefits of endurance training. While at the same time increasing the ever precious levels of testosterone! To fully understand how this program can help. You have to look at how the human body is designed. We were not created for long distance running, or extended periods of endurance workouts. Think I am wrong on that matter. 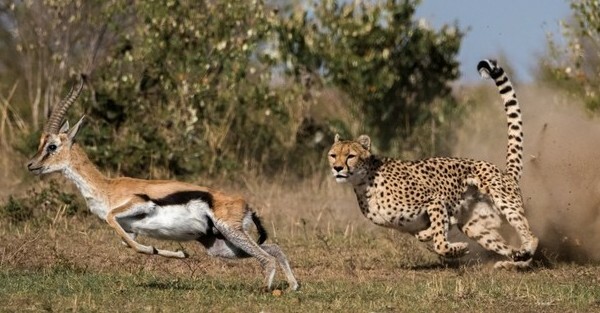 Just look at a gazelle, or a cheetah. Look at the design of their legs. These creatures were born to run , and run for vast distances. Now I hope that I have not offended you with the above photo, that is not my intention here. However I do think it is a great example of creatures that are designed for distance running and high levels of endurance. The gazelle runs to live and survive. Meanwhile the cheetah runs to eat and survive. Unlike the cheetah, our bodies were not designed to chase the gazelle. This goes all the way back to the stone age and our own survival. We are designed to ambush the gazelle with quick explosive movements. The idea to push the human body and test our endurance comes from a considerably more recent time. So how does this tie into the Anabolic Running Program? Well this program teaches you to use or given design for maximum benefit. You will learn to use short, explosive running techniques to achieve better results. In fact this program is so effective at taking advantage of how we are designed. It has proven to increase your growth hormones by 530% in the very first workout! Look, if you love distance running, that’s great. There is nobody saying that you can’t do what you enjoy. However if you have concerns about low testosterone levels. You may want to take those runs less often, and anabolic running can help fill that void. Another example of the benefits of high intensity interval training can be found in the weight room. Think about the bench press, squats, and the clean and jerk. There is no question as to how effective these exercises are, and all of them are explosive moves we preform for short intervals. The Anabolic Running Program follows the same approach, only using running as the method! *Here is a great workout from Joe LaGarbo to try at home. You do not need any equipment, just a little space. This workout will provide a great anabolic cardio workout using nothing more than your body! Again I want to stress that there is nothing wrong with endurance running if that is your thing. However if you have any concerns about Low T, or if you want a muscular hard body. You may want to consider your options. Anabolic Running offers an incredibly effective cardio alternative. You get all of the benefits related to cardio exercising. While at the same time, priming your body to produce natural free testosterone! In addition to getting the best of both worlds. It only takes 16 minutes a week! To this point we have only scratched the surface when it comes to the Anabolic Running Program. But worry not my friend. I have already written a complete review on this program. 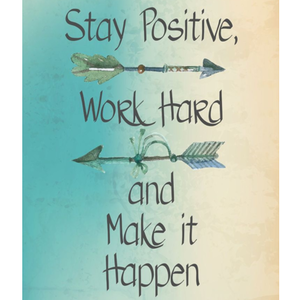 It outlines more study results, more benefits you stand to gain. As well as everything that is included in this program package. If you are hitting it hard on the weight bench, and want a better cardio workout option. 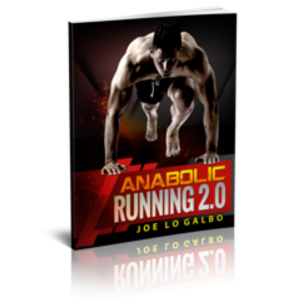 You owe it to yourself to learn more about the Anabolic Running Program today! Simply click on the Blue Button just below the program image and I will instantly take you to the review. In addition, I will show you how you can this this amazing program for just 15 Bucks! If you have any thoughts or comments about The Anabolic Running Program. Fell free to leave them in the comment box below, I look forward to hearing from you. Also if you have enjoyed this article? Please share us in your favorite social media circles!